Christian was born with a Tessier Cleft Lip and Palate which caused his eyes to cleft. He has had a surgery to close the cleft lip, and will require many more surgeries to repair the palate. He is such a happy and healthy little boy and he is so spoiled and so loved! He inspires people every day, and beams with the love of God. CHRISTIAN, You are a “PRECIOUS” gift from God and I deeply Love you and believe in you !!! Hi Christian! Sounds like you had a rough start little guy! But it looks like your Mommy and Doctors are taking good care of you! You are precious and I wish you a long happy, healthy life!! Did Dr. McKenna operate on him at Vandy? Before this morning, I had never heard of Christian. I saw on one of my friend’s websites a link to the video, so I watched it…and I fell in love with this story. Never before in my life have I seen such a beautiful family. His mother is such a blessing to me in that she never gave up when so many others would have. And Christian is an inspiration as well! It is the grace of God that gave him to her and because of that her life will be more fulfilling than it would have been if she had decided to make the other decision. No doubt there will be hard times, but with perseverance and prayer, everything will work out as it should. All I can say is God bless them both, and may they both enjoy long, happy, and fulfilling lives as the incredible people they are! I showed Christian’s picture to my 16 month old baby girl & she smiled and said “babyyyy” with the look on her face she gets when she sees something (or in this case someone) really cute & blew him a kiss. He is precious. And both he and his parents are a beautiful inspiration to the world. I’m sure they will influence many lives. Thank you for sharing your story. Thank you for sharing your story….You are an Angel and have such a wonderful family….Christian you keep smiling sweet-pea.. I can’t wait to see God’s plan unfold for you Christian! Your mommy and daddy are wonderful people and it’s no wonder God picked them to be your mommy and daddy! What an awesome God inspired story you have to tell. I can imagine the challenges, but would be so thankful to know that the blessings far outweigh them. God brings things into our lives to bring us closer to each other and closer to Him. Praise Him for His wonderfulness!! God’s blessings on you and your beautiful family! Christian your an amazing gift from God! and you are a very amazing handsome little boy…and your mommy is soooooo strong to be dealing with all the gossip dont let anyone tell you wrong that your sooo handsome and a miracle!! and your mommy is an amazing person!!!! your in my prays stay strong Christian and mommy :D!! You are a blessing from God, Christian!! Handsome, chunky lil guy… Happy Mother’s Day to Christian’s Mommy! God Bless your family! What a handsome and beautiful little boy! Christian, you and your parents are so blessed and loved! As my mother has always, always told me the human body is a beautiful thing and it comes in many, many different forms, all of them loved by God Your beautiful and joyous spirit and your parents’ strength and love are such an inspiration to everyone!! 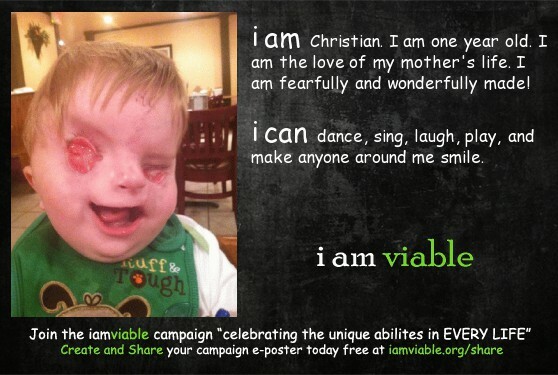 Thank you for sharing Christian with us – he is a little miracle!!! Lots of love !! Christian you are an angel that came down from heaven. You are a handsome little boy. I love you little angel. Your condition won’t stop you to have a bright future my little angel. I love you little baby angel. Your my inspiration to never give up on life little Christian. You symbolize hope baby boy. I wish you all the best. A happy Mothers Day to your Mom for doing the right thing. She is an angel in many ways. I believe every child has a purpose in life. They are not mistakes or tragedies, to be pitied. But people made for Gods special plans. I think right now Christian’s purpose must be to bring all of us some joy, but also to make us think about how we treat one another, and why we seem to judge, lable and dismiss those we don’t feel are worthy. Keep it up little guy, and congratulations mom and dad for making the choice to raise your little man. I wish you all of God’s richest blessings, may He give you strength for today and all the days ahead. Your Story brought tears of Joy for your Special sweet Boy!